Free rain checks: 2nd cleaning if rain ruins your perfect wash! For the many years they've been in business, they've made it their mission to provide the best quality service possible to win our customer's full satisfaction, offering a wide range of car wash and car detailing services. And they’ve shown their appreciation by coming back over and over. 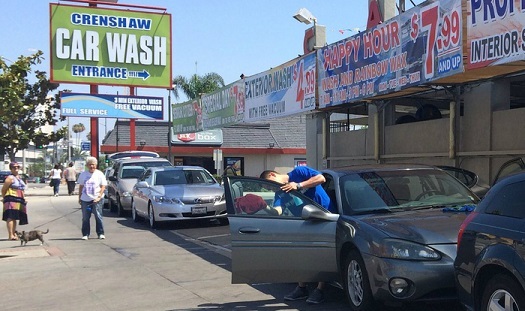 Crenshaw Car Wash has been an integral part of the community since 1961 and under the same ownership since 1986. It is a place where you can meet other members of the community and be seen, since their establishment attracts many personalities from the entertainment business, the sports industry and local government. Monthly pass: Love having a clean car? So does Crenshaw Car Wash. Buy your monthly pass today and they will scrub your car clean as many times as you want for a month. Passes are personalized just for you - inquire at the cash register on your next visit. Rain-check: Worried about the rain? No problem. They offer a FREE rain-check to all customers! They will scrub your car clean a second time if rain ruins that perfect wash.
Metro Perk: Pamper your car and protect the paint. Treat your car with a Hand Wax - starting at $35 (regular $45). Just mention you saw it here. Crenshaw Carwash is located at 4220 Crenshaw Bl, L.A. 90008. Find your best route with the Trip Planner.